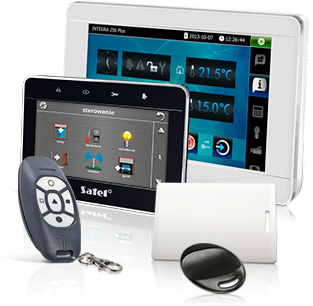 INTEGRA control panels make it possible to create a system combining alarm and home automation functions. Additionally, an optional module enables users to complement a system configured in such a manner with automation elements operating in the KNX European standard. As a result, we may obtain a system of more extensive functionality than in the case of employing separate solutions. An alarm system must be easy to operate as only they all its advantages may be used. To this end, while designing INTEGRA systems, considerable emphasis is put on creating and intuitive operation system friendly to all users. Numerous conveniences have been introduced for the benefit of the elderly or children. They include the possibility of controlling the system by means of proximity cards replacing passwords entered on keypads, similarly as in car alarms. Ease of use becomes particularly important in the case of integrated systems. It is with these solutions in mind that the INT-TSI touchscreen keypad has been developed, which allows you to fully exploit the potential of intelligent systems and makes it possible to use even the most complex functions in a simple and intuitive way. The wide range of control options in the INTEGRA control panels becomes particularly useful in the intelligent ("smart") building systems. 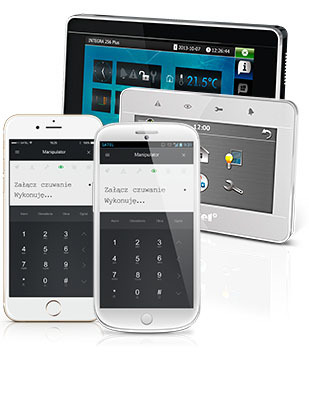 The INT-KSG touch sensor keypad, as well as INT-TSG, INT-TSH and INT-TSI touchscreen keypads may not only be used to arm and disarm the alarm system, but above all they offer a convenient solution to control the INTEGRA system automation devices and KNX devices. Thanks to the customizability of available menus to the user's needs, you can in a simple way and by using a single command e.g. select lighting scenes, rise the roller blinds, open the gate, position the roller shutters, and even control the heating or watering your greenery. You can easily take advantage of the possibilities offered by INTEGRA control panels even when you are outside the home. The INTEGRA CONTROL application running on your smartphone will allow you not just to arm and disarm the system, but also control all your home automation devices. The INT-KNX-2 module makes it possible to combine functionalities of systems based on INTEGRA control panels with the KNX home automation systems. 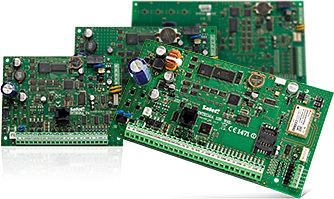 This combination enables users to control KNX devices by means of the INTEGRA system. It also enables an INTEGRA control panel to receive KNX devices status information. The benefits resulting from using INT-KNX-2 include mostly the synergy effect guaranteeing extension of the capabilities offered by both systems and decrease in the total installation costs. INTEGRA control panel may also cooperate with other automation systems. Among others, it is possible thanks to the INT-RS dedicated integration module and ETHM-1 Plus communicator. This combination not only extends functionality of the whole system, but also optimises its costs as a result of using common elements. By means of the available KNX modules controlling the illumination system, you can conveniently arrange light scenes in rooms where household members spend a lot of time. Depending on individual needs, you may not only activate and deactivate selected groups of lamps, but also adjust their brightness. 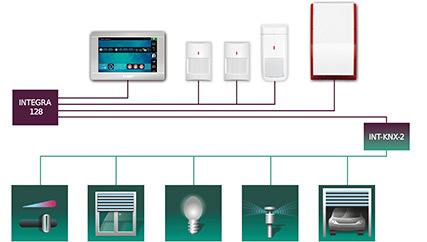 Smart heating control ensures not only your convenience, but also tangible energy savings. The INTEGRA system may be easily configured so that, when the standby mode is activated, the air-conditioning system is deactivated and the heating system enters the economical mode. The available KNX module let you control external shutters or blinds so that the amount of external light reaching the rooms is adjusted as necessary. You can even install driven curtain rods facilitating automatic opening of your curtains. INTEGRA control panels constituting the core of an automation system may make your life more comfortable even around your house. The available functions enable you to, e.g. control the opening of entry or garage gates. They may be opened by means of universal remote control keyfobs or mobile phones. This solution limits the number of devices you must keep handy. A smart system may also take care of of green areas. INTEGRA control panels lets you control different plant watering devices, e.g. lawn sprinklers. A similar method is used to water plants in your winter garden equipped with electrically controlled valves which control the watering process. During prolonged absences, an alarm system based on INTEGRA control panels is able to simulate the household members' presence, which may discourage potential burglars. It is possible to automatically control illumination according to pre-programmed time schemes or in response to particular events (e.g. in combination with a dusk sensor). The INTEGRA system switches the heating system into the comfort mode in advance and activates the floor heating system in the bathroom. Thanks to this, when you get up after, e.g. your favourite music wakes you up, you are surrounded with pleasant warmth and the word "alarm clock" will no more carry the connotation of something unpleasant. Curtains open automatically so that sunlight can illuminate your bedroom. Your children wake up in the same manner. This is what we call a great morning!! You activate the "Leaving for work" scenario on the INT-TSI keypad. All the activated lights switch off. The heating and air-conditioning system is switched into the economy mode and anti-intrusion shutters go down. The alarm system activates the standby mode to perfectly protect your house against any visits paid by uninvited guests. Your garage gate opens automatically followed by the entry gate so that you can start your daily journey to work. The INTEGRA system will switch the heating and air-conditioning system into the comfort mode in advance so that, when you return home, the temperature in rooms will be to your liking. Are you planning to return home earlier or later than usually? You simply activate the INTEGRA CONTROL application in your smartphone and remotely switch the heating system into a correct mode. While approaching your house, open the entry and garage gate by means of your phone or keyfob. This will also activate the blinds letting the sunlight in the rooms in your house. When you return home and open the door, the light in the hallway activates automatically hepling you find your way around the house when it is dark outside. Buying a new flat-screen TV and a home theatre system has been such a good idea! Finally, everybody will be able to watch movies in the cinema quality and with realistic surround sound. If you want to feel as if you were in the cinema, select the "Movie Night" scenario on your INT-TSI keypad. The INTEGRA control panel will lower the blinds, turn off the light in the living room and activate soft side lighting so as to avoid eye strain. If, while watching the film, you want to go to the kitchen or bathroom, the lamps in the corridor will come on - this is what we call a smart house! While in bed, you activate the night standby mode from your smartphone operating the INTEGRA CONTROL application. External shutters go down automatically and bedroom window curtains close. The backlighting of AQUA Luna sensors in corridors and on the staircase activates so that all traffic routes are lit with soft light. The perimeter protection system activates so that you can freely walk around your house at night while keeping it secure. The INTEGRA control panel will watch over your undisturbed sleep. Good night! Finally, the moment you have been looking forward to has come! You are going on holidays! Sun, sandy beach and serenity. While leaving the house for the next two weeks, you activate the "Holiday" scenario via your INT-TSI keypad. Lights go off, shutters go down automatically and the heating and air-conditioning system is switched into the economy mode. The system activates the standby mode, seemingly as every day. However, it will constantly simulate your presence at home so that possible intruders are misled. The system will also water your garden plants at preset times. Additionally, you can always check the system status by means of your smartphone, which makes you feel even more relaxed. All this will ensure that your house is in the condition you missed while being away from it.